The Amelie bathroom range is best known for its superior space-saving qualities, and it certainly doesn't stop here! The Amelie L Shape Bathroom Suite is the perfect purchase for those who have limited space in their bathroom but still want a stunning bathroom suite. Each item in this bundle is carefully crafted to allow you to create your dream bathroom from the soft lines of the basin and pedestal to the sleek L shaped bath, you're certainly getting your money's worth. The Amelie wash basin is a great addition to any modern bathroom. With contemporary styling and benefiting from a single tap hole you can give your bathroom a serious update. It features a flat basin rim coupled with soft, gentle curves and all finished in a beautiful crisp white. Underneath the white finish is porcelain covered in a luxurious vitreous china coating. It’s hard-wearing, durable and ideal for use in the bathroom. Give yourself plenty of space to wash your hands or clean your teeth with the Amelie basin. The full width of the basin is a huge 550mm, allowing ample space without imposing on the rest of the room with a large projection. 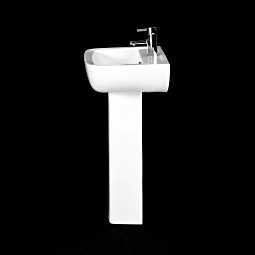 With the basin is the full or freestanding pedestal which not only helps to support the weight of the basin but also does the job of concealing any pipework that you wouldn’t want on display. This Amelie bathroom set is the perfect suite to complete your bathroom as it supplies you with everything you need for an ultra modern and stylish finish! Supplied with our L-shaped shower bath which can be right or left hand to suit you and your bathroom this suite is completely versatile and practical. All products in this set are made from high quality materials and with a fantastic guarantee on all, this should not be missed!